You've succeeded in losing a significant amount of weight, improving your health and appearance in many ways. But what are you supposed to do about the loose skin on your cheeks, jaw line, and neck? After all, no amount of diet and exercise will recontour this excess skin. Instead, you may need a face lift (rhytidectomy) to restore a more natural and toned facial appearance. Imagine looking more youthful by clearing out the loose tissue that reminds you of your former self. A face lift can restore a tighter and smoother look to the lower face through a series of carefully-placed and well-concealed incisions. During rapid weight loss, the skin naturally loses its elasticity and begins to bunch and sag in several locations. Facial skin is often one of the most noticeable areas where this "melted look" occurs, but you don't have to live with sagging facial skin for the rest of your life. Face lift and other facial enhancement procedures performed by Dr. McNemar have helped hundreds of people throughout the Bay Area and Northern California. You had many benefits in mind when you chose weight loss surgery in Walnut Creek or San Francisco - benefits like improving your health and energy, reducing your risk of certain illnesses, and enhancing your self image. Don't let loose facial skin stand in the way of your goals, when a trusted plastic surgery procedure can give you a remarkably more toned appearance. Dr. McNemar appreciates the importance of facing the world with confidence, and has helped many people just like you put their best face forward. Loosening of the facial skin and underlying muscle is a common occurrence after weight loss surgery in the San Ramon, CA area. A face lift is your best way to elevate the cheeks, remove skin folds, and tighten the jowls. Dr. McNemar also frequently performs neck lift (cervicoplasty) to remove loose skin and tighten muscles on the front portion of the neck. The goal of these procedures is not to completely replace your look but instead create a younger and thinner appearance that still "feels like you." Dr. McNemar uses several face lift variations depending on patient needs. Most post weight loss patients require what is known as a "deep plane" face lift to lift and tighten facial muscles and tissue just above the bones of the face. In less extreme cases, an intermediate depth face lift may be appropriate. Dr. McNemar can share more with you after he evaluates your case during a consultation. For post-bariatric patients, face lift is often combined with other facial rejuvenation procedures like brow lift and eyelid surgery. It also can be performed to complete the transformation for patients who are primarily interested in breast or body contouring. 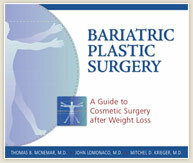 Surgical time will depend on whether the procedure is being performed on its own or in conjunction with other post bariatric plastic surgery. By tailoring every face lift he performs to the patient's unique needs, Dr. McNemar is able to achieve results that look natural and remain satisfying for years to come.